The Happiness Door is a great method of collecting instant feedback. I have used it successfully on my training sessions and recently had a first try to use it after my conference speech. In this post I present my case study and the reasons why I will definitely use it on upcoming events. Part 1. From the beginning. It becomes a tradition to end Warszawa JUG’s meeting seasons at the edge of June and July in a great style – with Confitura – the largest free conference about Java and JVM in Poland. This year the seventh edition was planned for about 1000 people and it took less than 2 days to sold out all the tickets (including overbooking). 5 parallel tracks with 35 presentations on various topics. From tuning JVM, different languages on JVM and a lot of frameworks though Java Script, Android, databases, architecture and testing to motivating people, Gordon Ramsay and company management in the 21th century. Too much to embrace during a day, but fortunately all presentations were recorded and will be available online. My presentation was about mutation testing in Java environment with PIT. I wrote a few posts on that topic already. In a nutshell – a nice way to check how good your test really are. Writing testable code had wide representation at Confitura – I counted four more testing-related presentations. Part 2. The Happiness Door method (if you new to this method read my previous post first). 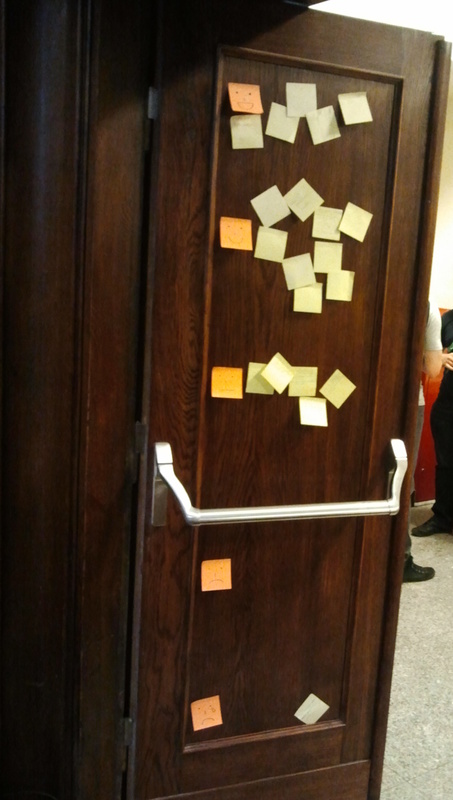 Before my presentation the sticky notes were distributed across the room and 5 smiley faces put on the door. At the begging I explained to the audience what was going on in this method and why their feedback was so important for me. Leaving the room about 50% attendees gave numerical feedback. 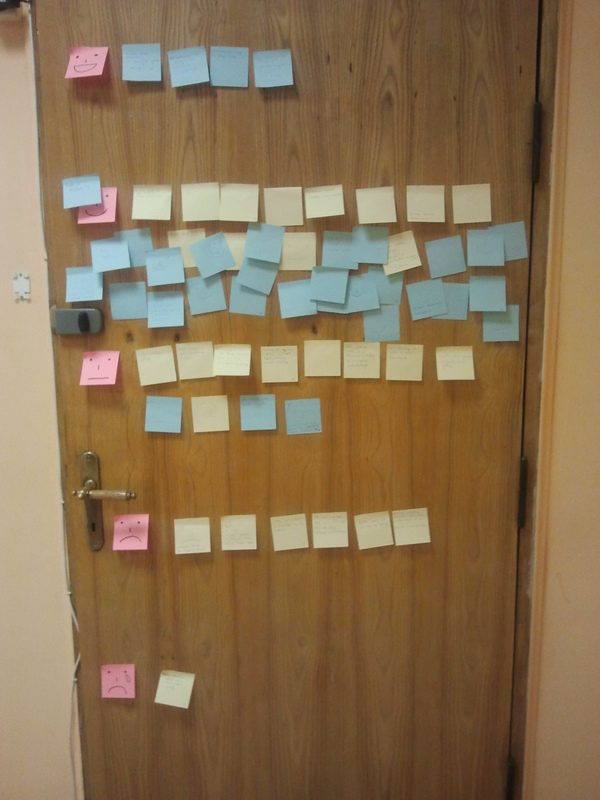 Almost half of them had some comments (from “nice talk” to an essay placed on both sides of a sticky note :) ). Some of them were very interesting. Thanks! I’m very happy I used this method on my speech. First time just minutes after a presentation I knew what people thought about it. In my case it was: “quite good, but there is still a field for improvement”. Here is a good place to thank Małgorzata Majewska and Anna Zajączkowska who helped me polish many aspects of my speech. The interesting thing is that when I have got an email from the organizers with the feedback collected using the online survey the average score was very similar, just got a month later, so why should I wait? With The Happiness Door method it is possible to get it know immediately (and even with the larger test sample). Btw, it is not easy to prepare to the presentation (there were as always some problems with a projector) and put a sticky note on every place in the audience room (~150 seats) in 15 minutes. Thanks to Edmund Fliski and Dominika Biel for their help with a distribution. Btw2, after the talk I had very interesting conversations with the people wanting to use mutation testing in their projects, the people already experimenting with PIT and Konrad Hałas – the guy from Warsaw who wrote MutPy – a mutation testing tool for Python. Part 3. The slides from my speeches evolves over time. 2 years ago my slides were full of the bullet lists – the feedback – boring, to much text. Recently I had some internal presentation with less than 10 slides with no text, just images – the feedback – hard to follow, to little text. In the mean time I did an experimented with a presentation based on a mind map – mixed feedback. This time I combined images and text – some people liked it some not :). Be the judge. The slides (in Polish) are available for download. Appendix. Thanks to Chris Rimmer for the idea of presenting IT topics using a metaphor to non IT events and people. I hope I encouraged you to give The Happiness Door method a try. Please share your experience in comments. P.S. Good news for all the people who missed my presentation at Confitura. My proposal was by accepted by The Program Committee and I will be speaking in Kraków at JDD 2013 (October 14-15th). The Happiness Door is a method of collecting immediate feedback I have read about some time ago on the Jurgen Appelo’s blog. I used it this year during my training sessions and it worked very well. I would like to popularize it a little bit. 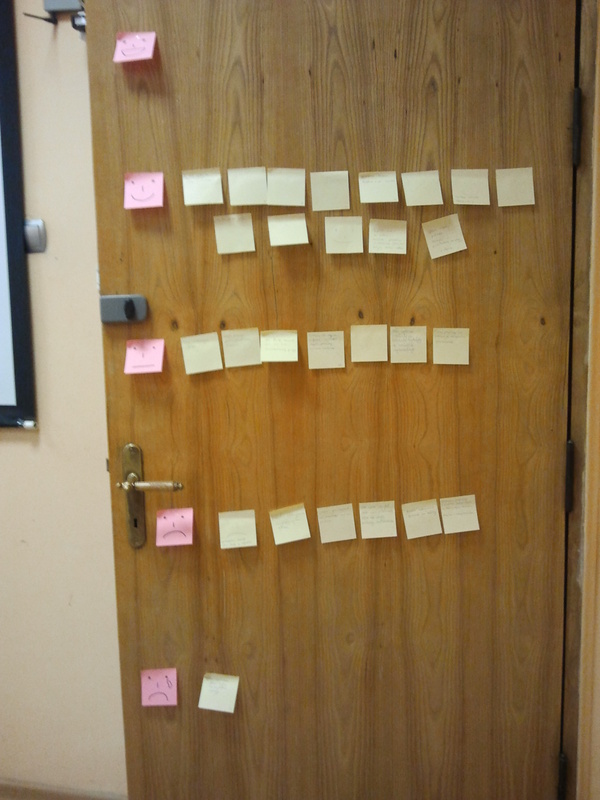 This method requires to select a strategically located place (like the second leaf of the exit door) with marked scale (I use 5 smileys from a very sad to a very happy one) and ask people to put distributed sticky notes on a level corresponding to their satisfaction of the session. They are encouraged to add a concrete comment(s) explaining given score (like “boring” or “too little practical exercises”), but it is completely valid to just attach an empty card in the selected place. The mentioned issues could be discussed with the whole group to determine how the given thing could be improved best. I start getting feedback before a lunch break on the first training day and gently remind about it on every following break. After my ‘Effective code testing’ training. (Almost) all attendies were pleased again :-). 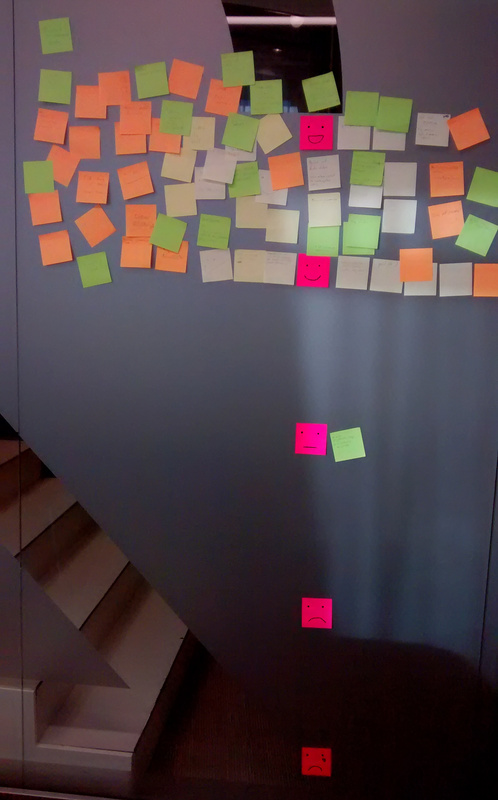 Update 2015: I decreased a frequency of obligatory opining to twice a day (after a lunch break and at the end of a day) to save some trees and give the attendees more time to consider the things. The main advantage of using this method is to get both instant numerical feedback (how much people like it) and concrete comments (what exactly do they (dis)like). The feedback is gathered very fast when there is still a room for improvements (in contrast to the more formal survey at the end of the training). I have got numerous comments from attenders that they like this method as well and I plan to use it also in my further sessions. On my courses I even introduced a small enhancement to the original method. Every day I give away sticky notes in a different color. It allows to easily distinguish feedback given on a particular day and identify a trend. On the photos bellow for example it is pretty visible that after a feedback I got on the first day (yellow cards) I was able to adapt my training to the group’s level and expectations (blue cards). This spring was quite busy for me as a trainer. I was a mentor at Git Kata – a free Git workshop, gave a talk about asynchronous calls testing on “6 tastes of testing – flashtalks” and recently did a short workshop about Mockito at Test Kata. In the meantime I conducted two 3-day training sessions about writing “good code” and plan one more Test Driven Development session at the end of June. Everything together with my main occupation – writing good software and help team members to do the same. What is more recently I’ve got very pleasant information that my presentation proposal about Mutation Testing was accepted and at the beginning of July I will close this training season speaking at Confitura 2013 (which nota bene was sold out (1200 tickets!) in less than 2 days). See you at Confitura.